HERE WE HAVE A GREAT LOOKING EXAMPLE OF A 2 SLIDING SIDE DOOR, 6 SEATER TRANSPORTER, WITH THE ALL IMPORTANT AIR CON & SAT NAV COMING DIRECT FROM LEASE WITH SKY. AS YOU'D EXPECT THERE IS A FULL VOLKSWAGEN MAIN DEALER SERVICE HISTORY WITH PRINTOUT, SHOWING SERVICES AT PDi, 24K, 41K, 65K INCLUDING CAMBELT. FULLY INSULATED AND CARPETED IN THE REAR WITH ONE OF THE TWO SIDE WINDOWS BEING AN OPENER AND A SECOND ROW OF GENUINE VW T6 SEATS WITH ISOFIX. 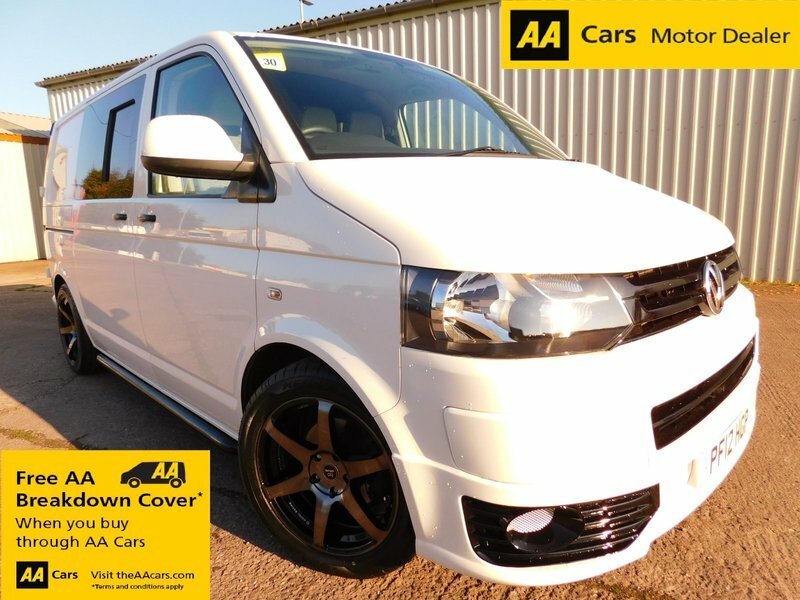 THE VAN SITS ON BRAND NEW 'DIBITE RACING' ALLOYS WITH ADJUSTABLE COILOVER SUSPENSION TO GIVE IT THE CORRECT STANCE AND SPORTLINE TYPE FRONT BUMPER, REAR SPOILER AND SIDE BARS WITH BLACK DETAILING TO FINISH IT OFF. THIS IS ALL ON TOP OF THE STANDARD SPEC WHICH INCLUDES TOUCH SCREEN NAV, AIR CON, CRUISE, BLUETOOTH, REAR PARKING SENSORS, ELECTRIC WINDOWS, ELECTRIC MIRRORS etc etc. IT COMES WITH ONE REMOTE KEY, A FULL BOOKPACK AND 3 MONTHS UPGRADEABLE WARRANTY.